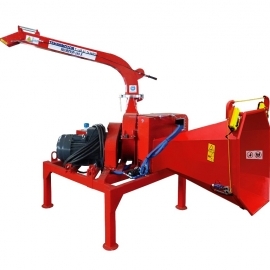 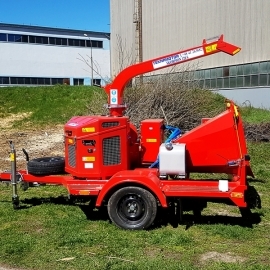 The model SKORPION 250 SDTG made by Teknamotor is the most technologically advanced mobile disc chipper available to community services, road companies and forestry sector. 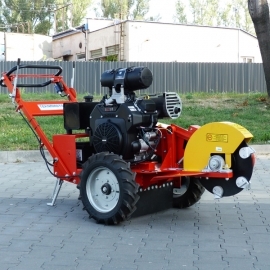 Thanks to its high processing capacity (the maximum diameter of the cut branches is 25 cm), it is excellent at grinding tree trunks and branches; its throat is 420 mm wide and 255 mm high. 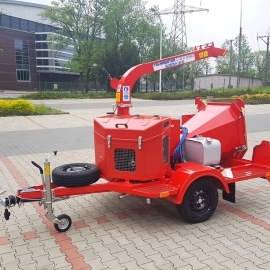 The driving system in this model makes a four-cylinder turbocharged Kohler or Hatz diesel engine with power of 74,8 hp; it is liquid-cooled and as a standard fitted with a mask. 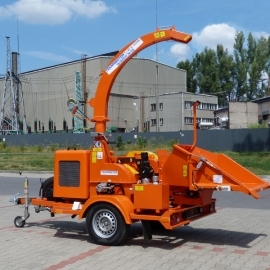 In order to maintain many hours of continuous operation, the chipper is equipped with a 60 liter fuel tank. 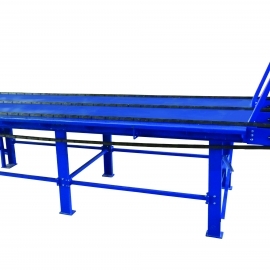 The standard hopper has been replaced with a hand-folded loading table. 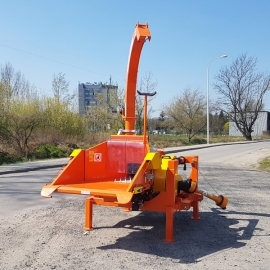 The material feed drive system consists of a toothed upper roller and a crawler feeder installed in the hand-folded feed table. 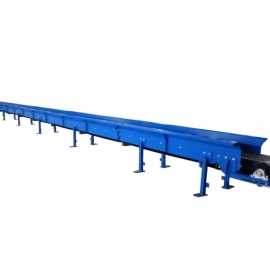 This solution allows easier loading of wood, which improves the operator's performance and improves efficiency. 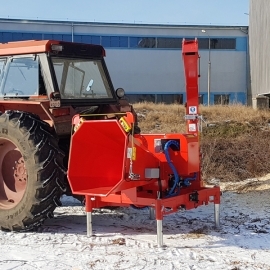 The roller and caterpillar is driven by hydraulic motors with reducers from the pump installed on the chipper. 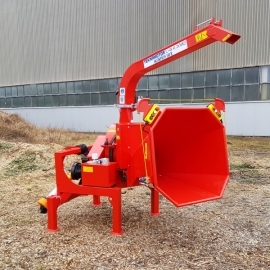 The cutting system in scorpion 250 SDTG is made by a disc equipped with two or three cutting blades, working with two counter knives. 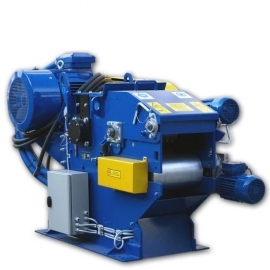 The cutting knives life has been optimized by their double-sided sharpening, which allows them to be rotated by 180°, resulting in twice the length of their use. 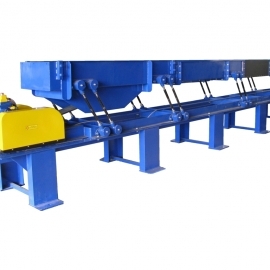 All the knives are made of appropriately selected tool steel and subjected to professional heat treatment. 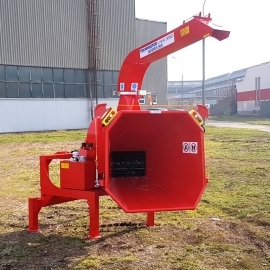 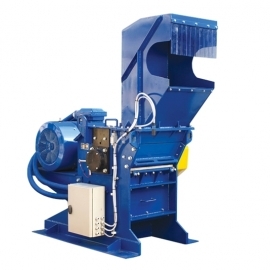 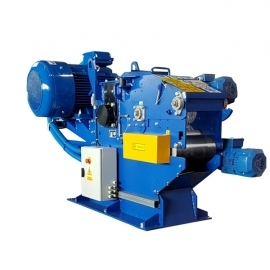 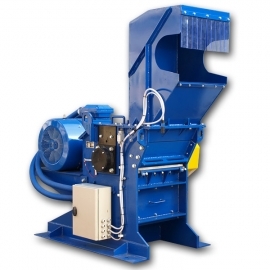 In addition, the chipper disc also fulfills the task of a fan and ejects the produced chips through the ejection tube, which can be positioned in any direction at a full 360° radius. 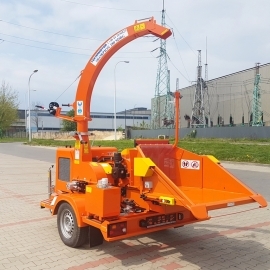 Safety of the operator of a chipper is ensured by a cable safety switch attached, which - by pulling the cord in any direction - causes the hydraulic feed system to stop immediately. 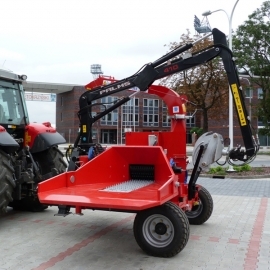 Unlocking the system takes place by releasing / unlocking the EMERGENCY STOP button to the work position. 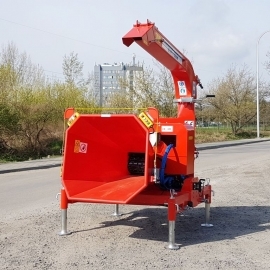 Skorpion 250 SDTG is equipped with one of the most modern electronic No-stress systems available on the European market; the system automatically prevents overloading of the drive system by temporarily stopping the feeding. 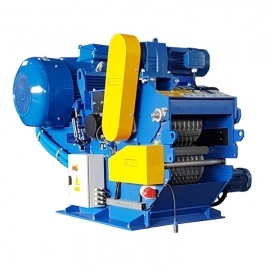 Editing the No-stress overload system allows you to easily change the machine settings and adjust them to individual needs. 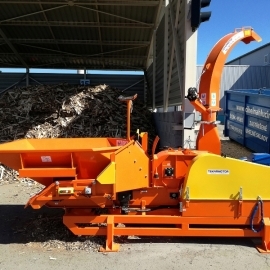 The program "thick wood", "thin wood" allows a quick change of the working mode of the chipper to suit the currently shredded material and more effective work of the wood chipper. 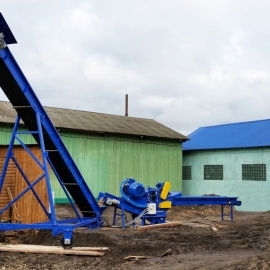 This system has a built-in hourly meter. 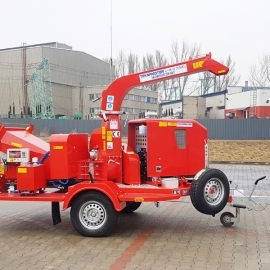 The Skorpion 250 SDTG chopper has received European approval, which permits registration of the machine and traffic approval. 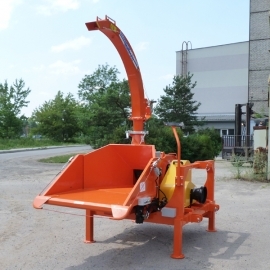 It is equipped with overrunning brake and parking brake, LED traffic lights and a choice of spherical or eye catch. 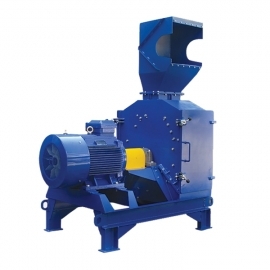 The wood chips obtained through the chipping process can be used for direct combustion in furnaces, for production of compost, for decorative purposes and, after repeated shredding in hammer mill, as a raw material for production of briquettes and pellets.